Oscar Wilde once said “Man is least himself when he talks in his own person. Give him a mask, and he will tell you the truth.” If you have ever wanted to see this statement in action, look no further than the Whisper app. Whisper allows you to post messages completely anonymously into a sea of other anonymous people both nearby and worldwide. It’s an intriguing concept for sure, but does it deliver a worthwhile experience? Let’s dive in. Posts range from funny to sweet, sad to enraged. Almost anything goes. 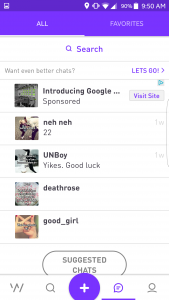 Whisper has you set up a profile when you first begin. Now, this is unlike any other profile setup I’ve seen before because it’s 4 questions long. Location is set by location services on your phone. Usernames have no restrictions, even allowing you to keep it blank, and multiple people are allowed to use the same username, so in my attempt to stay anonymous, my use of the username “anonymous” completely blends in with the hundreds of others who use it too. Gender is optional, age range is optional. Location I have heard can be disabled but I couldn’t find a way, so I simply denied it permission to location services so my location is just set as “somewhere”. Jumping into settings allows you to set notifications preferences. That’s all there is to it. No pictures to set, you’re not locked into giving your e-mail address, and your username or any settings can be changed on a whim. The app starts off with a “Most Popular” page, which is a great jumping off point. All posts that make it to this main page have hundreds of thousands of likes and comments. Posts here range from posts that will make you lose faith in humanity and redeem your faith again, stories of random acts of kindness to love lost, and everything in between. One swipe to the left will show you various groups based on both location and general interests where people can make posts about specific subjects. If your location is set, one swipe to the right of the main screen will let you see all posts that are nearby your location starting with the most recent. Finally, there is an “All” option to the right of local that, as you guessed it, shows all posts from everywhere. Writing posts is not only easy, but it’s kind of fun too. Hitting the big + button near the bottom of the screen brings up a text box that lets you write your post. Once you write something, Whisper then reads your post and searches for a background picture or short looping video that matches your post. In my experience, the words that it picks to search for pictures with isn’t always the subject of the post, so sometimes the pictures it tries to have you pick from are a little random, but there is a place for you to enter your own search terms and select from a large library, or you can upload your own images. 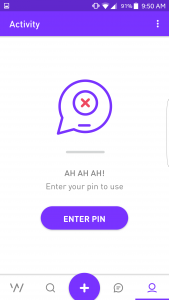 All your posts are saved on the app so you can look at all you’ve posted but it’s all locked under a pin that you set so everything is secure from private eyes, even if they have your phone. There’s a chat built right into the app so you are able to either reply directly to posts or if things are going to become more personal (or intimate) you are able to start one on one chats with people. It’s in these chats that your gender and age are revealed if set, so that’s something to keep in mind if you’re worried about people knowing this information. There are an equal number of users that reveal info and that keep it all private so it’s easy. There are loads of posts by guys who only want to chat with women (which is fine), some who want to only dirty chat with women (which is a little creepy), and some who want to cheat on their spouses and/or pay for pictures and sexual acts (eww). Obviously, these kinds of things all depend on which direction your moral compass points, but for me personal, I was not at all a fan of these posts. Fortunately, there are about a hundred posts for every one or two of these, but with dedicated groups for these posts, they definitely do exist. With the ability to be anonymous, you get people posting some of their darkest secrets and insecurities. Occationally you’ll run across a post discussing issues such as suicide. Obviously this is a very serious issue, and the team at Whisper handles this like a champ. If a post could be considered of a deeply depressed or suicidal in tone, the app will direct people to a collection of people to listen or professional help. I’ve run across several posts where people have thanked Whisper for reaching out and have credited the app with saving their lives because they were very serious about their intentions and being able to get the help they need changed their lives. It’s a brilliant feature and has literally changed lives. 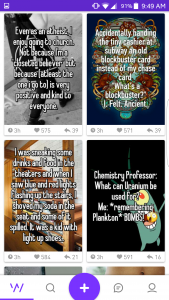 I’ve been a user of Whisper for about 6 months now, and I’ve got to admit that it’s quite the guilty pleasure for me. You’ll find posts that are happy, sad, angry, excited, and everything in between. Set your options just right and post literally anything on your mind. It can be a lot of fun and a liberating experience where you can be free to speak your mind about anything to anyone on there. I highly recommend this app as one to at least play with for a week, and you might find that it becomes a daily addiction. Whisper is a brilliant app that allows you to be yourself under the cover of complete anonymity. I took off a half star from the setup for the inability (that I could find easily) of disabling location without blocking the permission. Other than that, its a full 5 stars for a fun, freeing app run by people who care.